Add style and protection for your front end with our wrap-around grille guard. Guard bolts together and features 2 light tabs and black powder coating. Shown with optional top "euro-hoop". 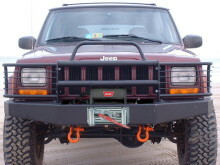 Requires winch bumper (sold seperately), will not fit factory bumpers.